It was a frigid November evening, but my digital daughter, Amanda, and I were wrapped in a blanket of storytelling at New York City’s Symphony Space. Hosted by Matthew Love of Selected Shorts, it was a night to celebrate “The Best American Short Stories 2014,” with selections by Pulitzer Prize Winning Author Jennifer Egan. Egan offered insights into this edition’s common themes – despair, hope through the support of others, wild animals – along with her own list of prerequisites for inclusion, most notably an ability to engage the reader in surprise and current truths. I closed my eyes and escaped into worlds created by Lauren Groff and T.C. Boyle – and performed by actors Amy Ryan and Dylan Baker, respectively. Matthew Love was all wit. As part of his commentary, he riffed off of what other, more modern-day writing collections, might look like. He postulated that in our short-take society we might want to see, “The Best American Paragraphs,” “The Best American Sentences,” or even “The Best American Tweets” – adding that maybe they would be pamphlets instead of tomes. I thought I could contribute another trilogy, “The Best American Hashtags,” “The Best American Emoji Sentences,” “The Best American Selfies.” I bet they would sell (attention any agents out there wanting to get it on this, l’m #allears). I was also #allears when Jennifer Egan talked about how in the last 20 years, technology has unapologetically and definitively transformed how our world looks and feels. Watch a film with a corded telephone, a phone booth or a typewriter and you know you are experiencing life sometime before 1994. If you see a smartphone, or iPad, and tweets are flying across the screen, then welcome to the 21st century. And we are not going back – just speeding forward. When it was time for intermission, I looked over at my daughter and we gave each other the big-eyed look of approval. “So good…” she exhaled. And, then she whipped out her iPhone and started tapping through Snapchat. Huh?! So while I was still reveling in the reading, my daughter was trying to make the right funny face to snap to her friends. I wish I could show you, but with Snapchat, the images are fleeting. Gone in seconds. I get it…I do. 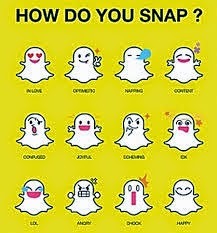 It’s like saying, “I’m thinking of you,” but with a personal photo; a “picture that is worth a 1000 words.” But with our teenagers who tend towards one-word answers to our explicit questions, will our communication turn into a “rolled-eye” Snapchat photo when we try to engage? And, what’s next? A heartbeat sent from our child’s AppleWatch, just to let us know that they are alive? It’s all up for grabs, and it’s all relevant, but let’s keep the art and engagement of storytelling alive!